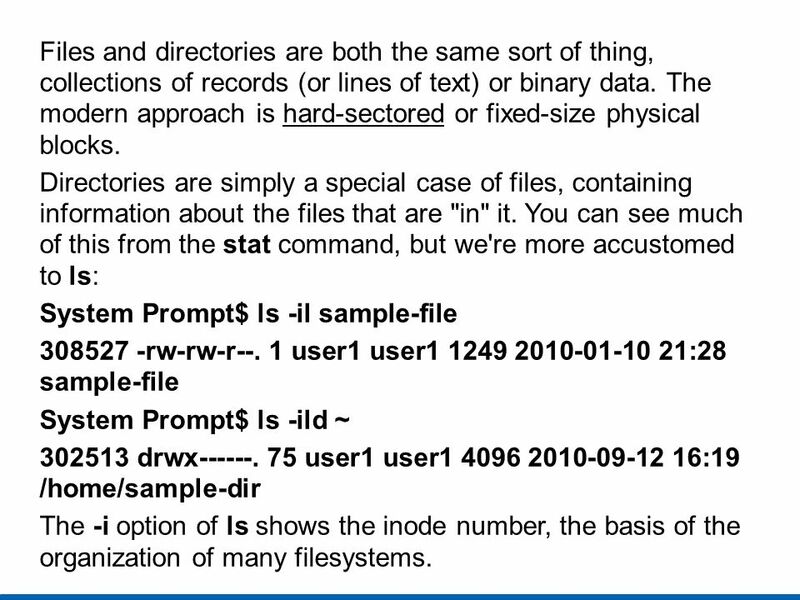 2 Files and directories are both the same sort of thing, collections of records (or lines of text) or binary data. The modern approach is hard-sectored or fixed-size physical blocks. Directories are simply a special case of files, containing information about the files that are "in" it. You can see much of this from the stat command, but we're more accustomed to ls: System Prompt$ ls -il sample-file rw-rw-r--. 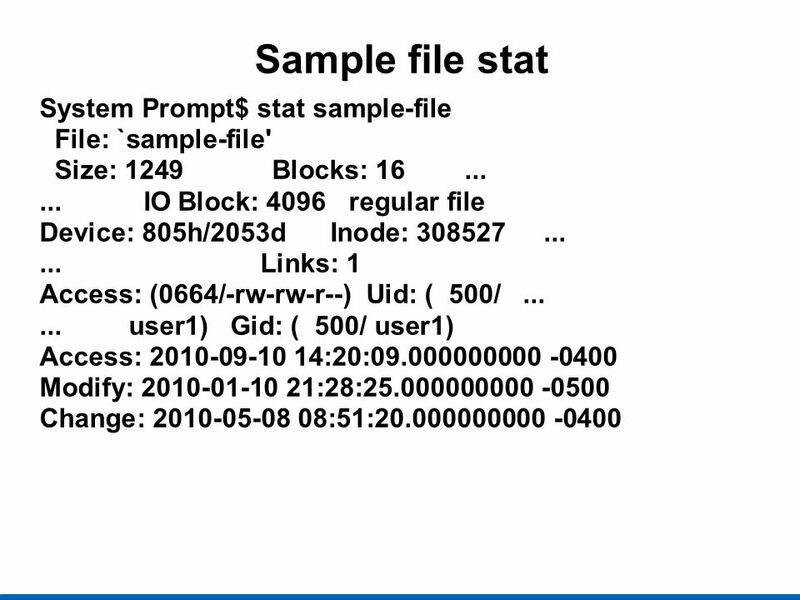 1 user1 user :28 sample-file System Prompt$ ls -ild ~ drwx user1 user :19 /home/sample-dir The -i option of ls shows the inode number, the basis of the organization of many filesystems. 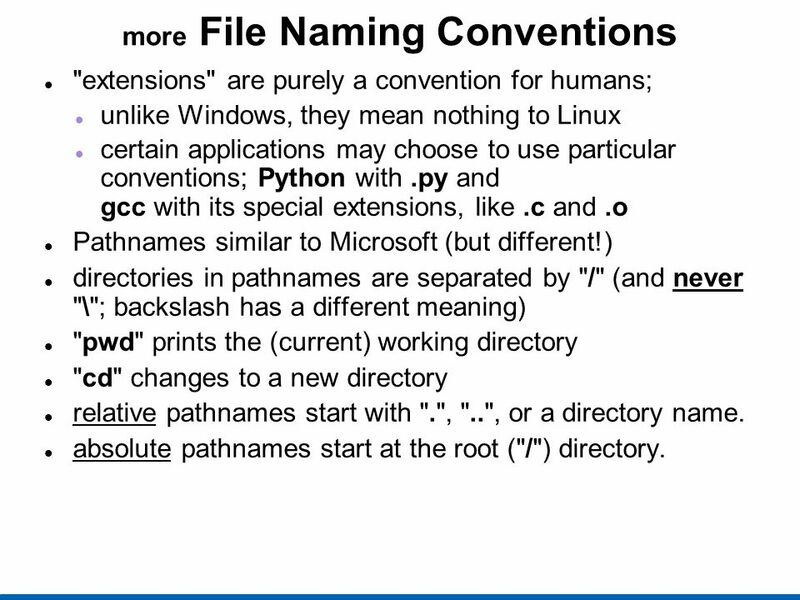 "extensions" are purely a convention for humans; unlike Windows, they mean nothing to Linux certain applications may choose to use particular conventions; Python with .py and gcc with its special extensions, like .c and .o Pathnames similar to Microsoft (but different!) 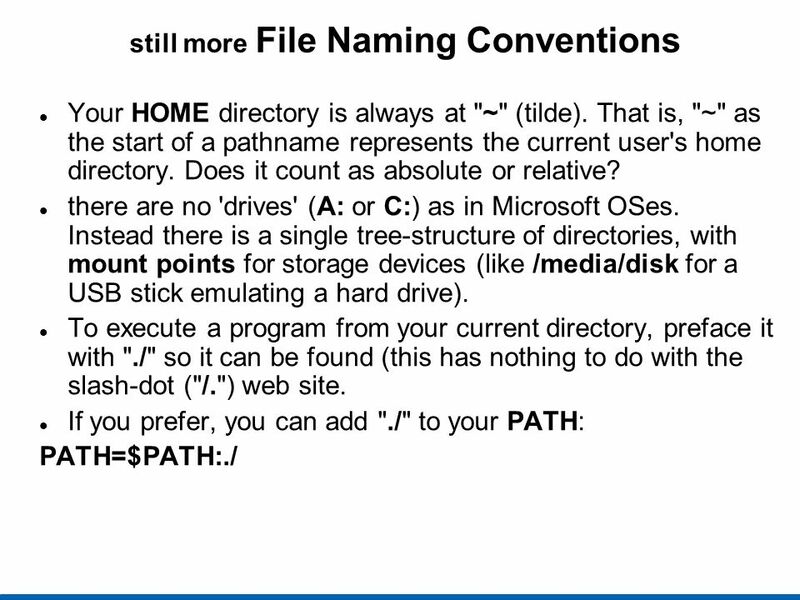 directories in pathnames are separated by "/" (and never "\"; backslash has a different meaning) "pwd" prints the (current) working directory "cd" changes to a new directory relative pathnames start with ". 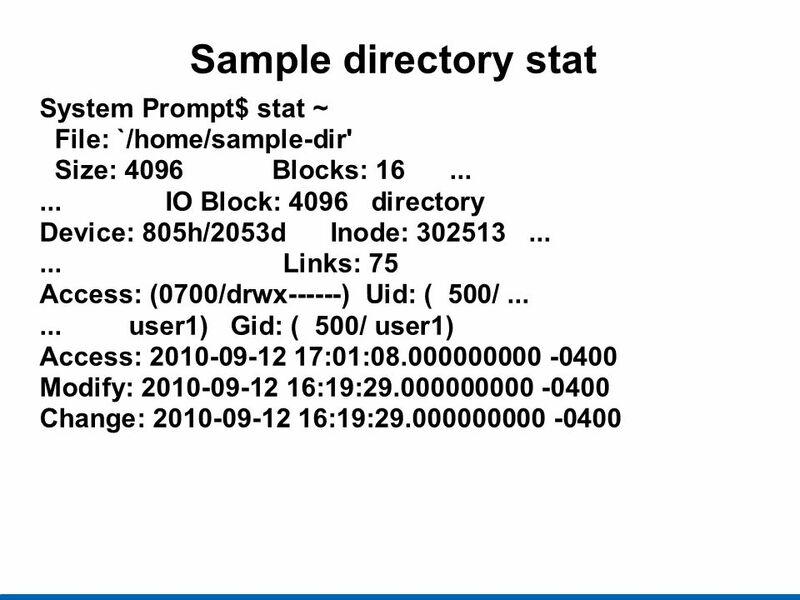 ", "..", or a directory name. absolute pathnames start at the root ("/") directory. /def/def/jhi/some.file.or.another A sample relative path (from where?) 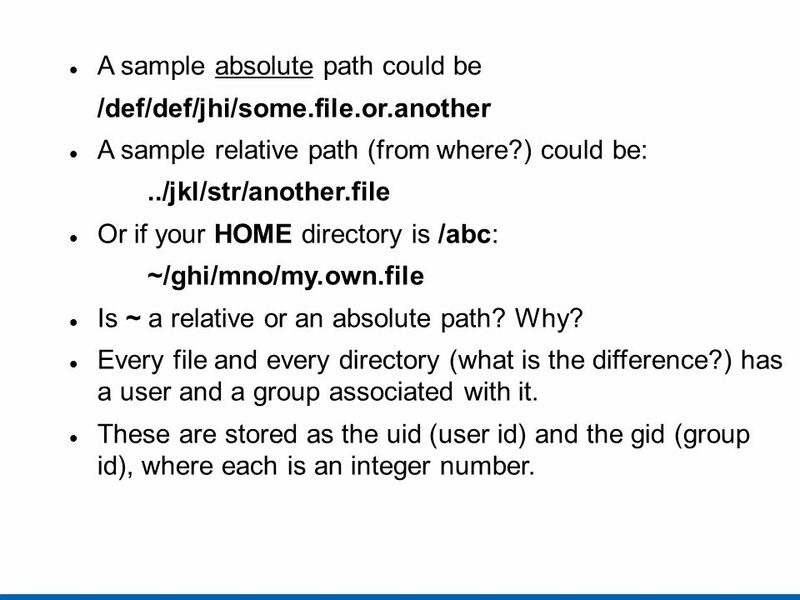 could be: ../jkl/str/another.file Or if your HOME directory is /abc: ~/ghi/mno/my.own.file Is ~ a relative or an absolute path? Why? Every file and every directory (what is the difference?) has a user and a group associated with it. These are stored as the uid (user id) and the gid (group id), where each is an integer number. mkdir dirname Creates a new directory. 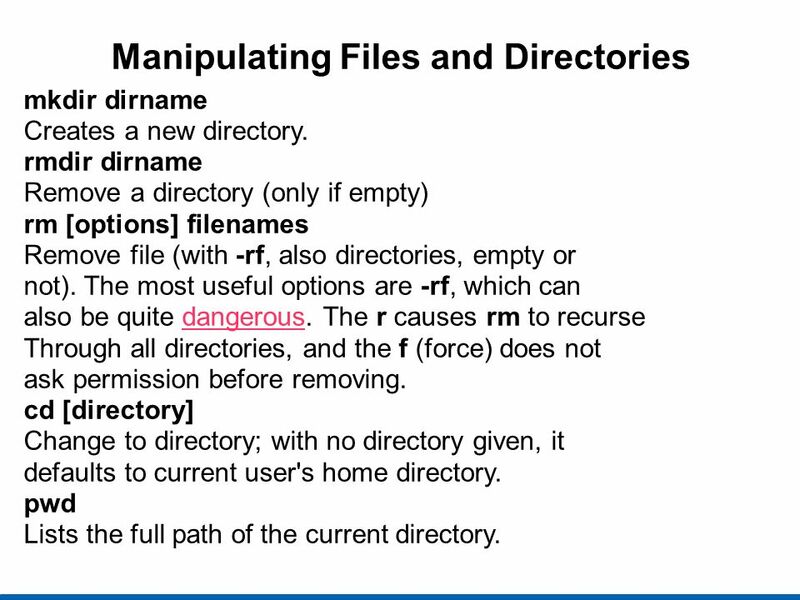 rmdir dirname Remove a directory (only if empty) rm [options] filenames Remove file (with -rf, also directories, empty or not). The most useful options are -rf, which can also be quite dangerous. The r causes rm to recurse Through all directories, and the f (force) does not ask permission before removing. cd [directory] Change to directory; with no directory given, it defaults to current user's home directory. pwd Lists the full path of the current directory. 11 cat filenames Catenate files to stdout/screen with no formatting; list a text file's content (see also tac). date [options] Set or display the system date and time; see the man page for details to use this. cp [options] source destination Copy files and directories. 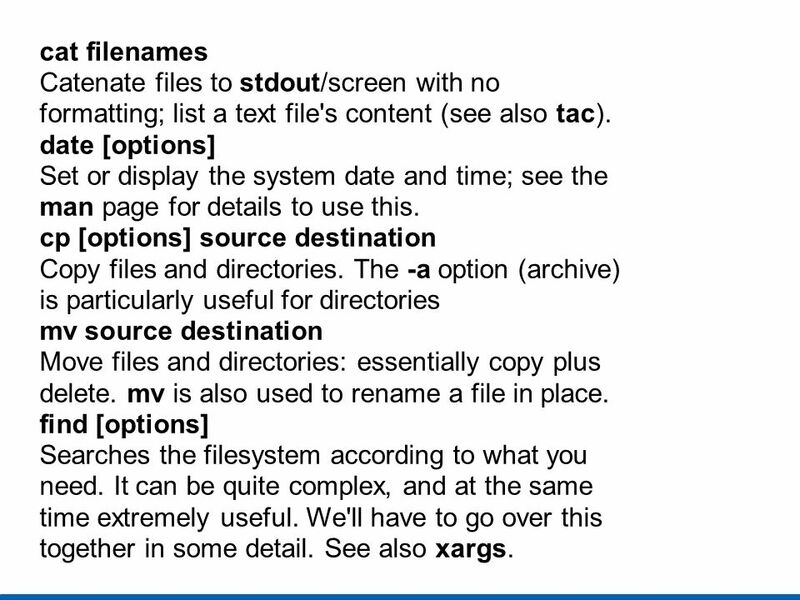 The -a option (archive) is particularly useful for directories mv source destination Move files and directories: essentially copy plus delete. mv is also used to rename a file in place. find [options] Searches the filesystem according to what you need. It can be quite complex, and at the same time extremely useful. We'll have to go over this together in some detail. See also xargs. 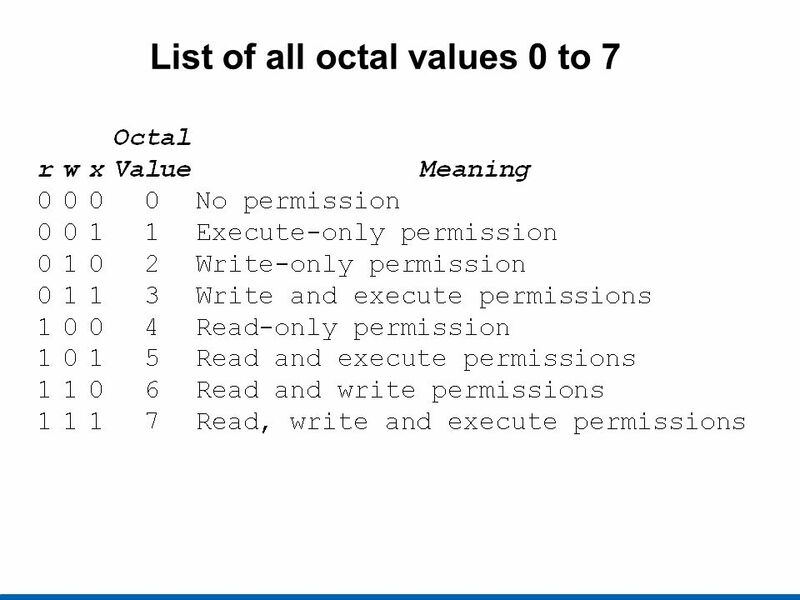 Lists the paths for binary, source, man page for a command for certain well-known directories. locate [options] name Reads a database usually updated daily for files. It does not check if files found still exist and never reports on newer files. more [options] filenames Like cat, but pauses at the end of every screenful (page). Now often replaced by less. 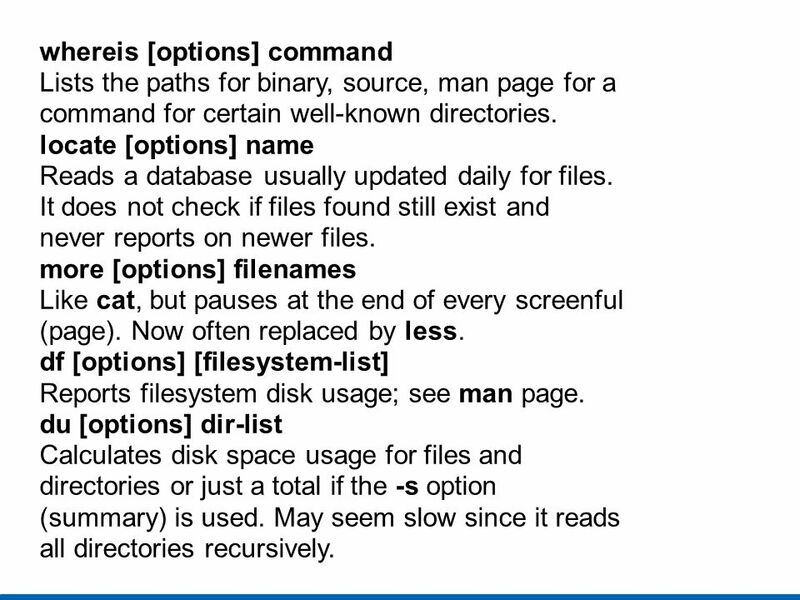 df [options] [filesystem-list] Reports filesystem disk usage; see man page. du [options] dir-list Calculates disk space usage for files and directories or just a total if the -s option (summary) is used. May seem slow since it reads all directories recursively. 13 whoami Displays the effective user ID (particularly useful when switching from one user to another) who [options] Displays information about users who are currently logged into the system, locally or remotely. vi [options] filename Standard command-line editor with multiple options and extensive capabilities. Always available in any level on any Linux/Unix system. 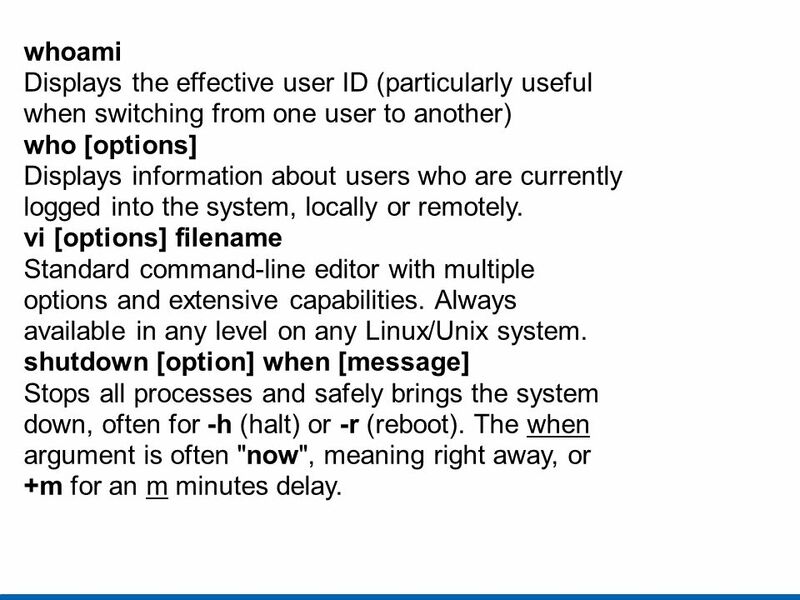 shutdown [option] when [message] Stops all processes and safely brings the system down, often for -h (halt) or -r (reboot). The when argument is often "now", meaning right away, or +m for an m minutes delay. 14 exit Terminate the current shell process. Often used to Leave a script. Can also be used to exit a shell instead of Control-D (^D, stdin end-of-file). telinit runlevel Change the current runlevel. Must be root. runlevel Display the current and former init-process runlevel or N if no former runlevel exists. head and tail [options] filename Lists the start or end of a file; see tail -f. dmesg Displays the critical content of logs for the last boot sequence. su [user] - Superuser command, to change userid. The - or -l option emulates login. 15 touch file-list Updates the time and date stamp. If the file does not exist, an empty one is created. echo some text here > filename The echo built-in displays its arguments on stdout. By redirection, a non-empty file can be created or replaced. With >>, the arguments are appended to an existing file or behave like >. ln [option] source destination Creates links between files. 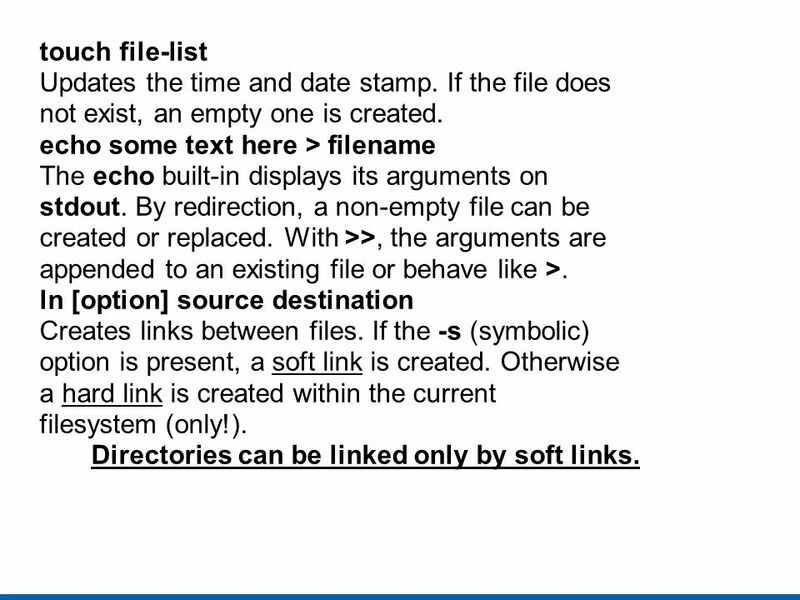 If the -s (symbolic) option is present, a soft link is created. Otherwise a hard link is created within the current filesystem (only!). Directories can be linked only by soft links. 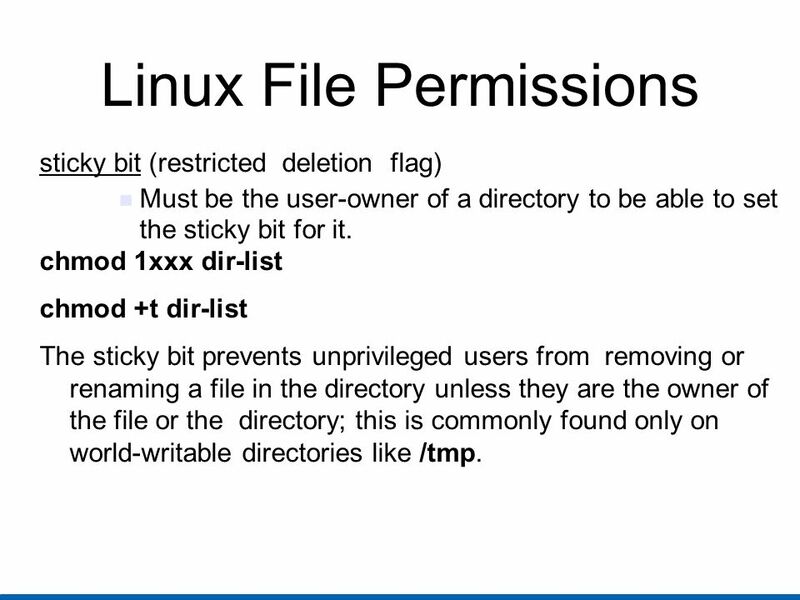 sticky bit (restricted deletion flag) Must be the user-owner of a directory to be able to set the sticky bit for it. 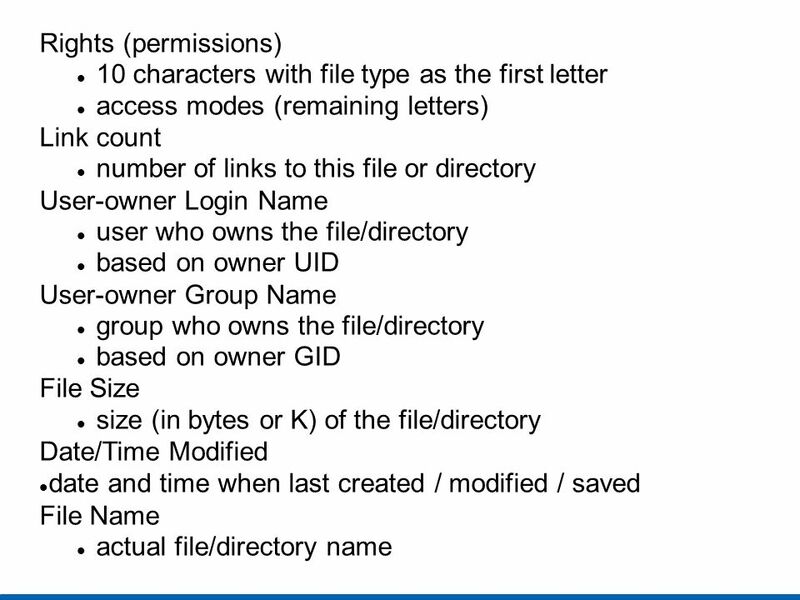 chmod 1xxx dir-list chmod +t dir-list The sticky bit prevents unprivileged users from removing or renaming a file in the directory unless they are the owner of the file or the directory; this is commonly found only on world-writable directories like /tmp. 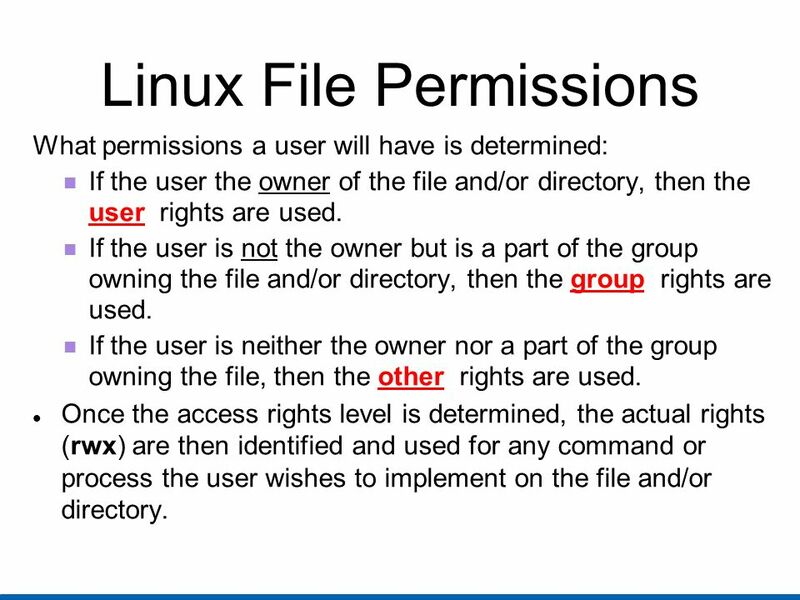 What permissions a user will have is determined: If the user the owner of the file and/or directory, then the user rights are used. 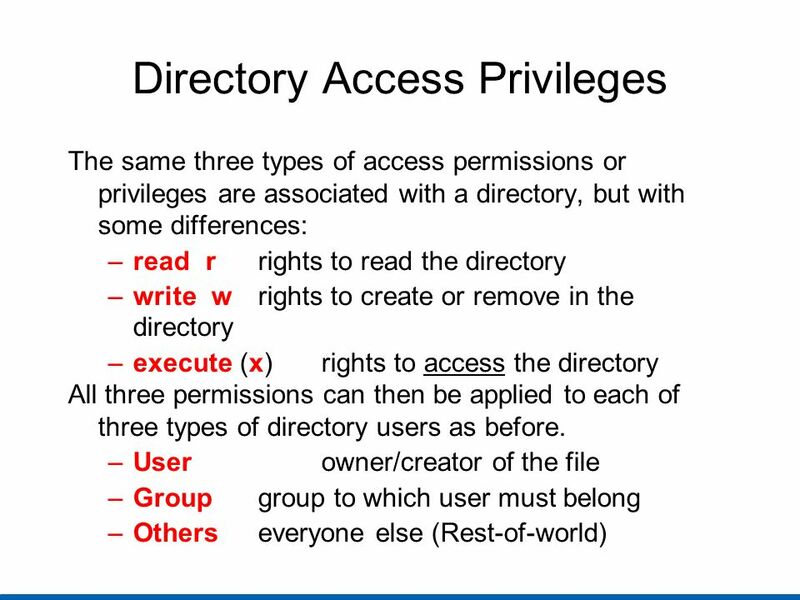 If the user is not the owner but is a part of the group owning the file and/or directory, then the group rights are used. If the user is neither the owner nor a part of the group owning the file, then the other rights are used. 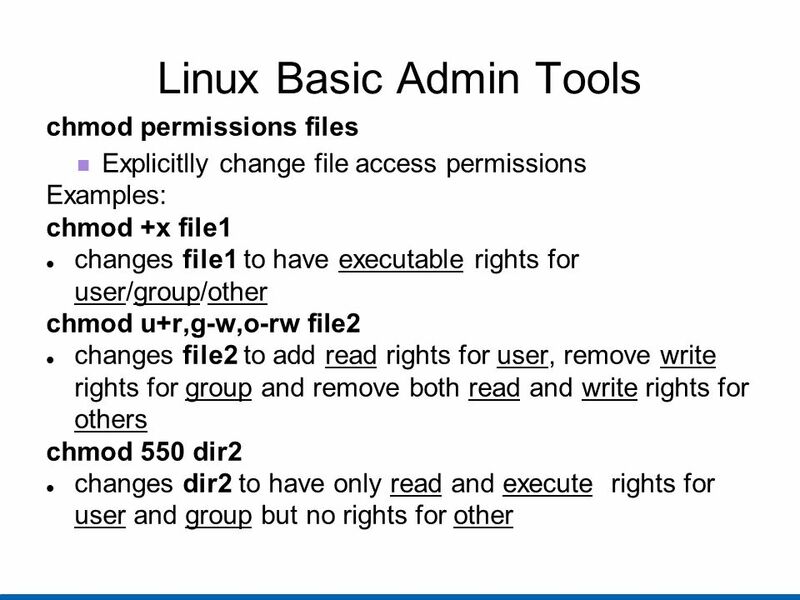 Once the access rights level is determined, the actual rights (rwx) are then identified and used for any command or process the user wishes to implement on the file and/or directory. 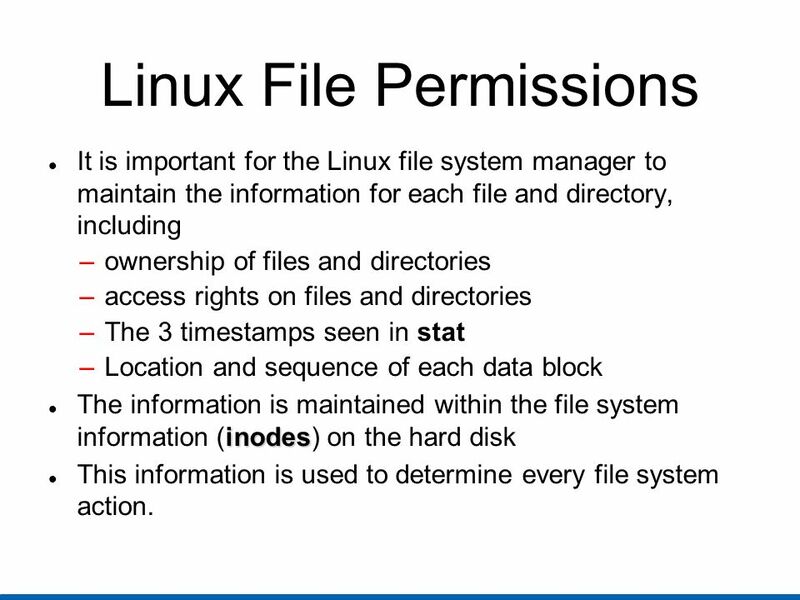 It is important for the Linux file system manager to maintain the information for each file and directory, including ownership of files and directories access rights on files and directories The 3 timestamps seen in stat Location and sequence of each data block The information is maintained within the file system information (inodes) on the hard disk This information is used to determine every file system action. 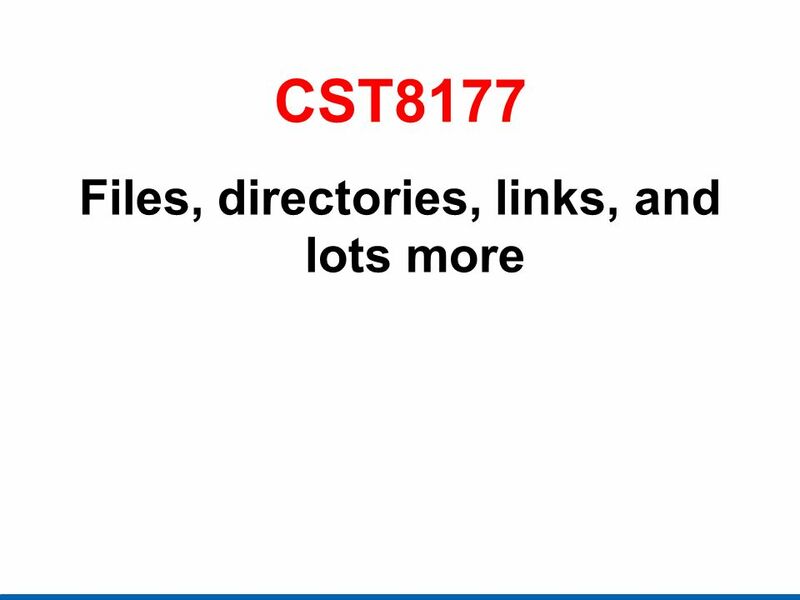 Download ppt "Files, directories, links, and lots more"
The UNIX File System Harry Chen Department of CSEE University of MD Baltimore County. 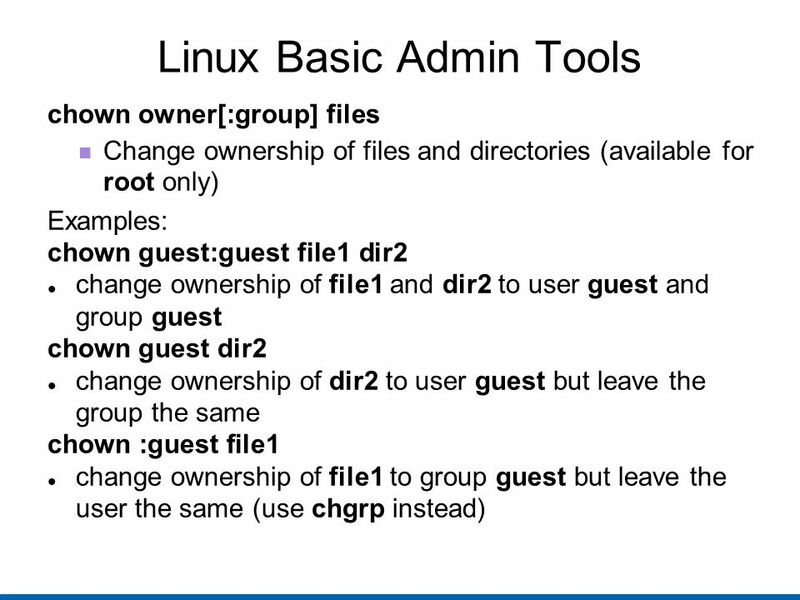 5 Basic utilities When a user logs in to the Linux operating system the directory that they will start in is their home directory. Most users will have. Introducing the Command Line CMSC 121 Introduction to UNIX Much of the material in these slides was taken from Dan Hood’s CMSC 121 Lecture Notes. 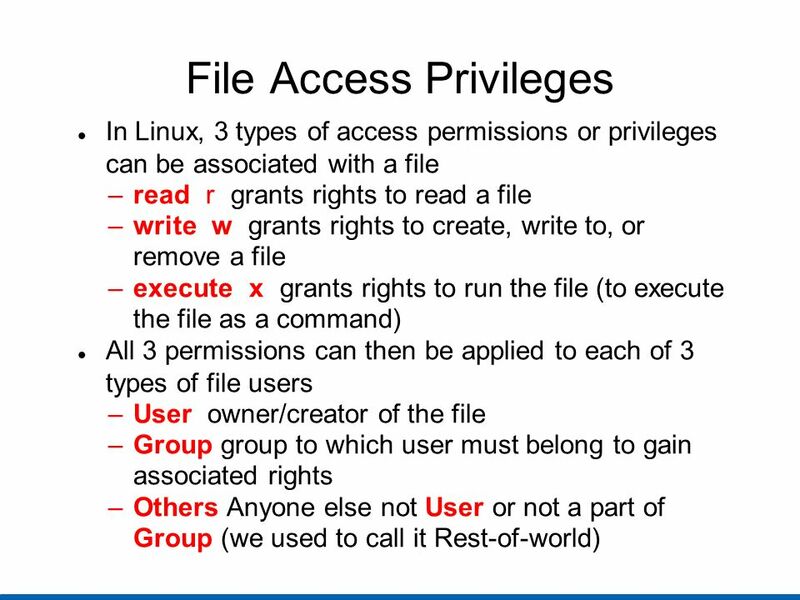 1 CSE 303 Lecture 4 users/groups; permissions; intro to shell scripting read Linux Pocket Guide pp , 25-27, 61-65, , 176 slides created by. 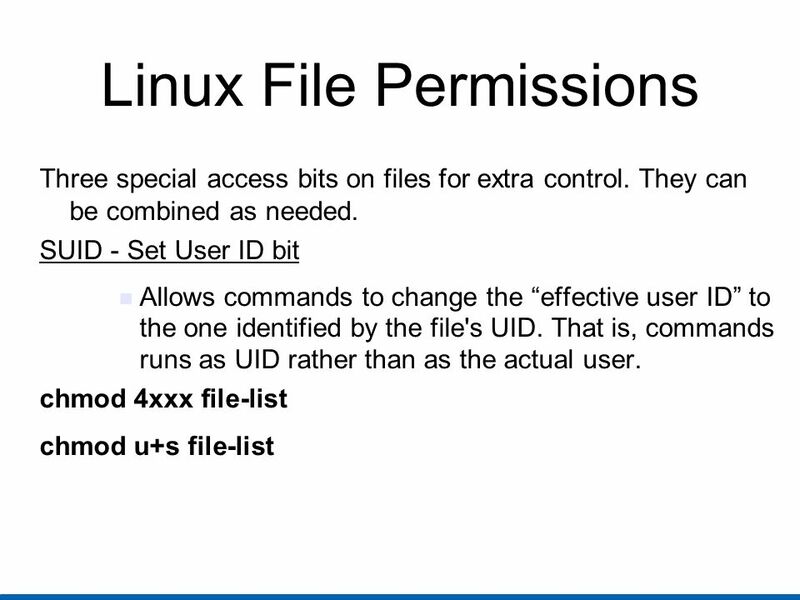 Linux Files. Files and directories As in Windows directories are structures which contain –Other directories –Files. 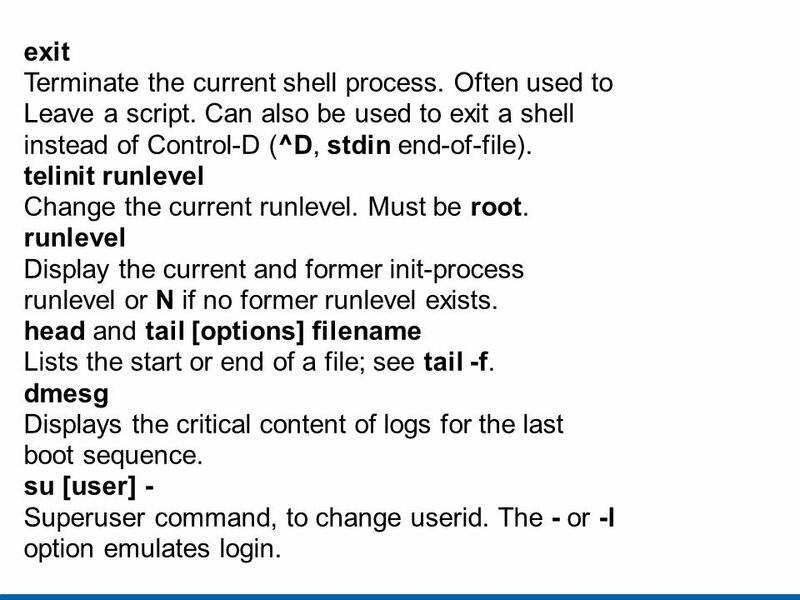 Lecture 02CS311 – Operating Systems 1 1 CS311 – Lecture 02 Outline UNIX/Linux features – Redirection – pipes – Terminating a command – Running program. 1 SEEM3460 Tutorial Unix Introduction. 2 Introduction What is Unix? An operation system (OS), similar to Windows, MacOS X Why learn Unix? Greatest Software. 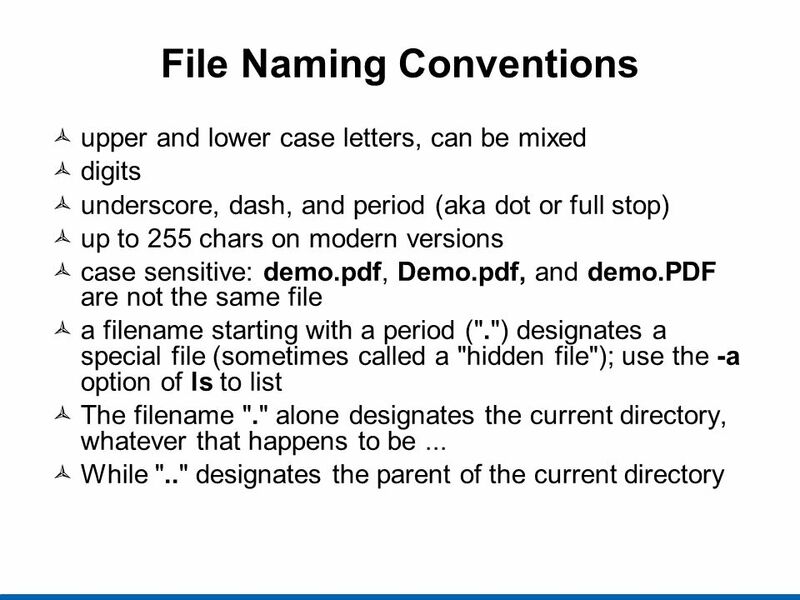 COMP1070/2002/lec4/H.Melikian COMP1070 Lecture #5  Files and directories in UNIX  Various types of files  File attributes  Notion of pathname  Commands. 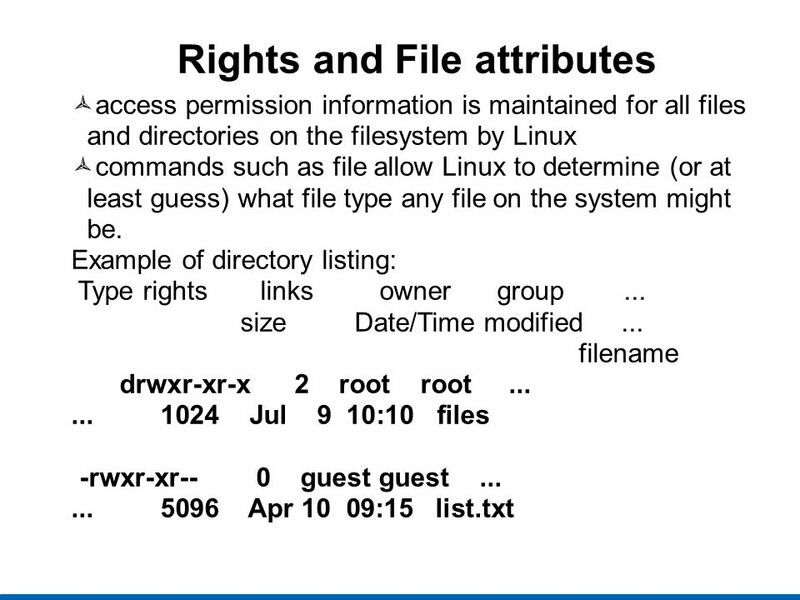 Filesystem Hierarchy Standard (FHS) –Standard of outlining the location of set files and directories on a Linux system –Gives Linux software developers. Va-scanCopyright 2002, Marchany Unit 6 – Solaris File Security Randy Marchany VA Tech Computing Center. 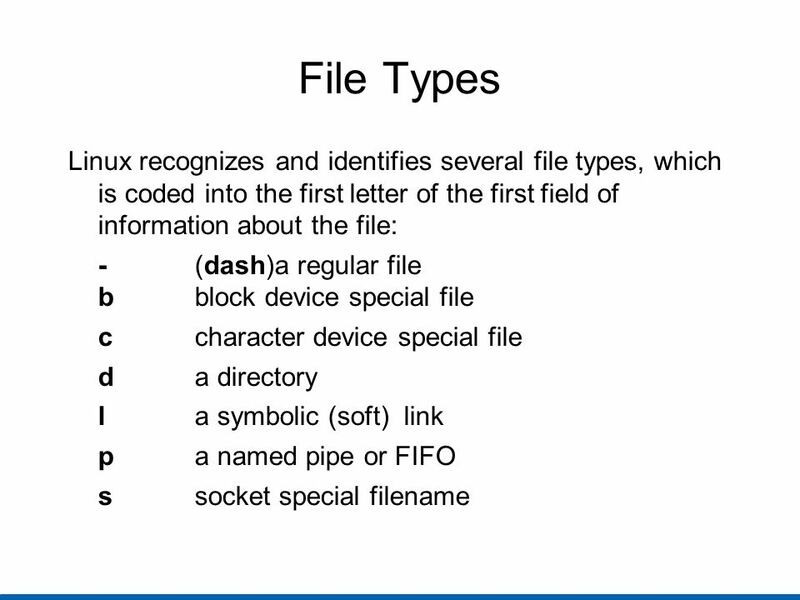 1 THE UNIX FILE SYSTEM By Chokechai Chuensukanant ID COSC 513 Operating System. 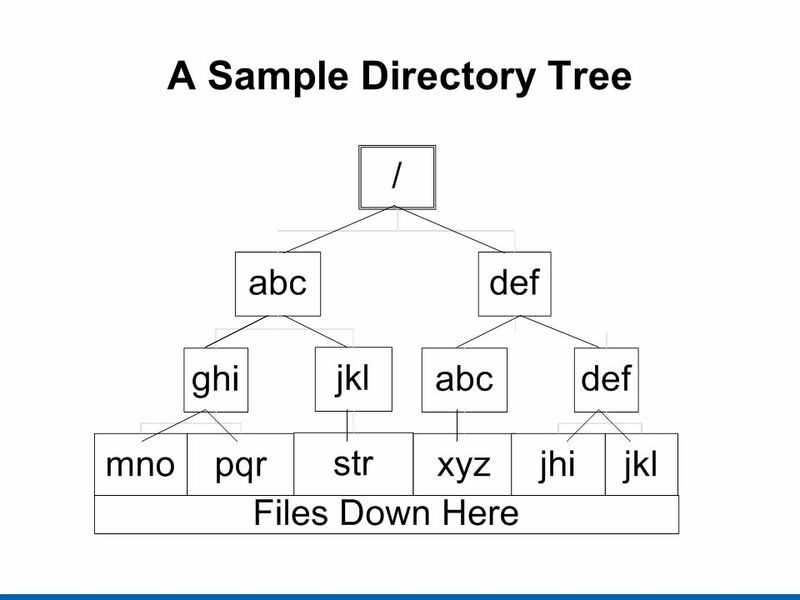 The file structure and related utilities CS240 Computer Science II. 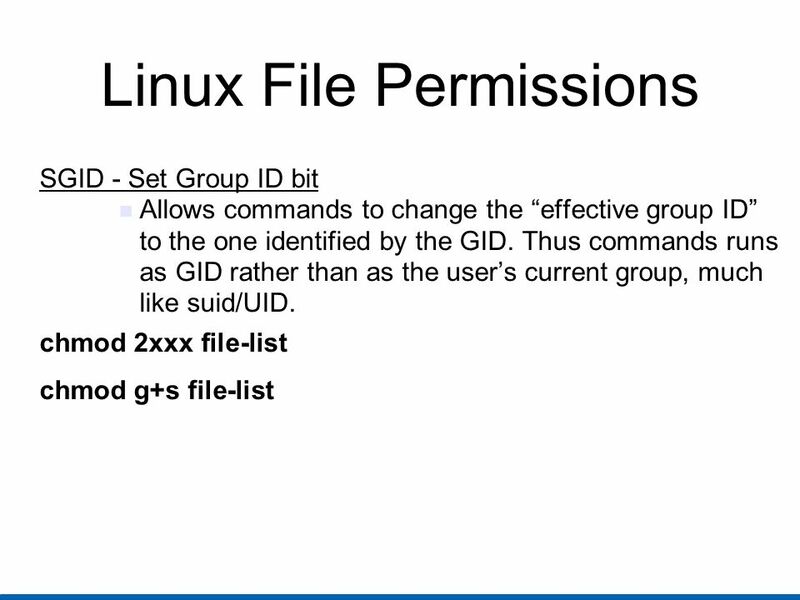 1 CSE 303 Lecture 4 users/groups; permissions; intro to shell scripting read Linux Pocket Guide pp. 19-20, 25-27, 61-65, 118-119, 176 slides created by.